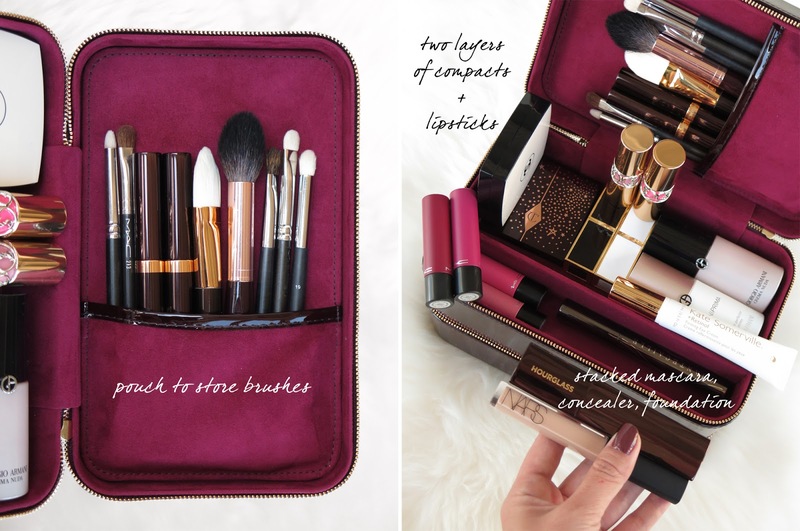 Many of you have asked for a review on this year’s edition of the Bobbi Brown Beauty Case ($160, limited-edition) and today I’ve teamed up with Nordstrom to share what I can fit inside it. 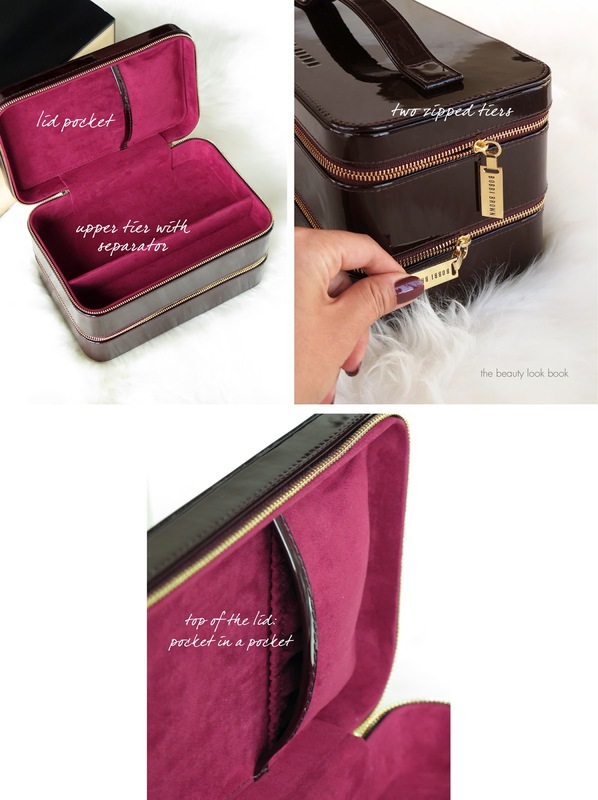 This is a new travel case for the holiday season with two zippered tiers and compartments to house anything from makeup, skincare, beauty tools and travel-sized minis. There have been various launches of the Bobbi Brown train case over the years in different materials, colors and set options. The first one I received was the classic black leather one back in the 2002 time frame and it has special meaning to me. My boyfriend bought it for me when we first started dating (now my husband). He picked it up while in London at the airport and was so excited when he came back to the US that he had found something he knew I would get a lot of use out of. He said “it can hold all your makeup!” It was just so thoughtful and since we had only been dating for under a year I was so surprised he would know to even look for something like that as a gift for me. I was even more touched that he carried it on the plane all the way from London. It’s held up remarkably well and I’ve carried it on the plane (without liquids of course) and also on other occasions packed in my suit case. This year’s version comes in a rich burgundy faux patent leather material. As with most patent materials it will be on the more delicate side so you will need to be careful about it touching materials that could have color transfer. Fingerprints will show so I’d recommend using clean hands to handle it, but I would recommend that for any type of leather good whether it’s patent or not. It is well made though and very sturdy so I do believe it will hold up well. The color is simply gorgeous. It’s the exact same in size as the previous cases on the exterior measuring approximately 9 inches wide, 5.75 inches tall and 5.75 inches deep. The configuration inside is a bit different in this year’s version as the top portion has a horizontal separator to help keep items in place and the base has no pockets. The top of the lid does have a pocket to store items. It has another elastic pocket inside which can hold your brushes in place. If you’ve followed me for a while you will know that I pack a lot with me on travel and even in my daily or weekly bag I tend to accumulate a lot with me. Many of you are amazed that I’m able to pack so much in limited spaces – it does take careful placement and maneuvering like Tetris to make things fit in a way that as little space is wasted, but you can fit a lot inside a suitcase or travel case if you arrange things in a certain way. I’ve included a wide variety of items, brands and products I would actually travel with to see what I could fit in the Beauty Case. As usual I’ve found that this little case can house a lot of items from face and base makeup, blush, highlighters, skincare, brushes, lip color, eyeshadow, powders, mascara, gloss, eyeliner and an eyelash curler. As I’ve used my black travel case on numerous occasions and weekend getaway trips I really find it to be perfect. In the lid I can fit in quite a few brushes and slim lipsticks (I have two of the Tom Ford Lip Contour Duos inside). In the base of the lid there’s enough depth to stack two compacts where I put the Chanel Les Beiges Healthy Glow Powder and Charlotte Tilbury Legendary Muse Eyeshadow Palette. Two stacked rows of lipsticks will fit as you can see two layers of MAC Liptensity, and the YSL Rouge Volupte Shines stacked on top of two Tom Ford Lip Colors. What fits inside the base includes the Hourglass Ambient Lighting Surreal Light Palette, Moroccanoil Treatment (the 1.7 fl oz version is shown), Charlotte Tilbury Flawless Finish Powder (best setting powder ever, I use Shade #2), MAC Blemish Control Gel, various face oils including the Kiehl’s Daily Reviving Concentrate and Kate Somerville Dilo Oil, sunscreen, lip gloss, lipsticks, shadow stick, blush, eyelash curler, mini perfumes and more. There’s a bit of a gap in the upper portion so there’s a bit of extra room to fit items in case they are a bit taller than the base. Products shown linked below as well. Colors shown above: MAC Powder Blush in Prism, Bobbi Brown Luxe Lip Color in Neutral Rose, Laura Mercier Caviar Eye Stick in Rosegold, Chanel Glossimer in Wild Rose, NARS Illuminator in Hot Sand, Charlotte Tilbury Air Brush Flawless Finish Powder #2. If you’ve been eyeing the Bobbi Brown Beauty Case for holiday I hope this gives you an idea of what kinds of things you can fit inside. I think it’s great for travel or mini getaways – especially if you’ll have some trips coming up for the holiday season for family get-togethers you can store a little bit of everything inside. I’ve used mine on mini trips ranging from 3 days to a full week. It’s worked for me on road trips as well. I’m glad she re-launched the case in a new version this year. I would still love for it to be a permanent addition to the line. It is on the pricey side but I’ve gotten a lot of use out of my black leather one (going on 15 years now!) and it’s held up really well. 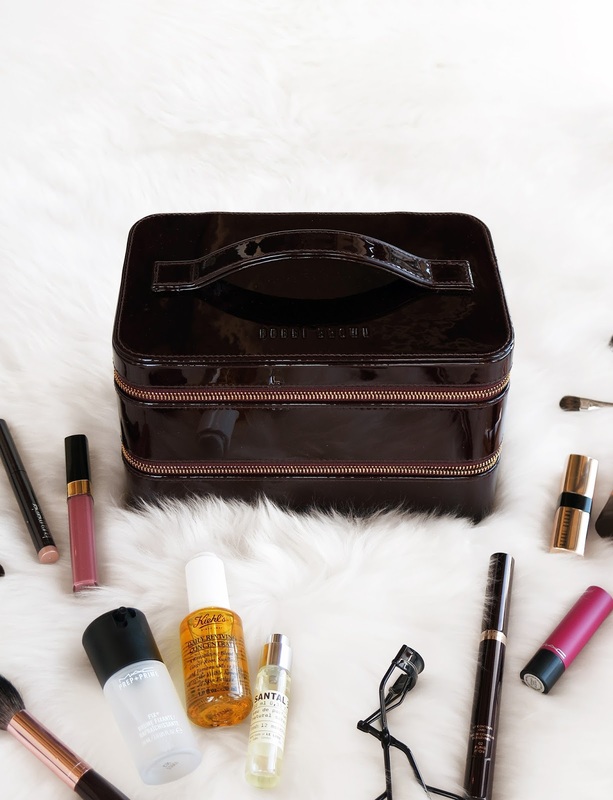 You can find the Bobbi Brown Beauty Case right now at Nordstrom. Don’t forget to check out the Gift with Purchase page as they do update their special offers section frequently. This post was sponsored by Nordstrom. Press samples featured include the Armani Prima, Kate Somerville Dilo Oil, Kate Somerville Eye Serum, MAC Liptensity, Hourglass Vanish Seamless Foundation Stick. As always all opinions my own.